Well, not quite so much Didn’t we have a phrase for this? I don’t know how these things work but . . . he’s the Queen’s husband. I’d think he’d be able to manage a full-time driver. Maybe denying him a driver is her maj’s way of keeping him on the porch. I suspect each and every story that’s been run has boosted public sympathy towards the old boy. That’s enough? We’ve been hearing from the families of Hillsborough victims, the family of Stephen Lawrence, etc. for decades. Why should Phil’s car crash be any different? Gina Miller must be a bit fucked off at the publicity this woman is getting. Does anyone think that the media obsess over such trivial news to keep our minds off the continuing gilet jaune protests, now in their 13th week, I believe, and the anti-government protests in Madrid at the weekend – for Newmaynia’s benefit, that’s in Spain? Newmania seems to be clogging up the blog more often recently, treating us to his hysterical illiteracy about Brexit and claiming he’s dead cultured because he likes Gilbert & Sullivan *laughs contemptuously*. Perhaps John Redwood has banned him. Apparently he was blinded by the low sun. Could have happened to any driver, regardless of age. Plus she* was driving too fast – hence first police reaction was “we need a speed limit on that piece of road”. She knocked his car right across the road so hard that it rolled over when it reached the verge. There’s a d-notice over here regarding the yellow jackets, so the MSM won’t report any of the state violence and killings against them in France. It’ll just be vague stuff hinting at ‘far right extremists’ and the like, and/or playing down the numbers. The police made it clear there was no suggestion the Kia was speeding: it was doing a legal speed on an A-Road. There wasn’t even a road junction to be cautious of: Phil the Greek emerged from a track. Note that he would have needed to look NORTH to see the Kia, and in the UK, the sun is dazzling in the North direction, never. So translating his own story, he was driving west into the sun, and didn’t even see the A-road he was driving across. And I have considerable sympathy for the Kia occupants. A broken wrist isn’t trivial, the loss of the car a major expense (even when the insurance pays out, eventually, it won’t be anything like replacement value), inability to work with that injury will have career and wage impacts. And no doubt she will relive the moment up to impact for many many nights. It was a life changing experience for both of the women, and not in a good way. I wish them well; the nightmares do stop, eventually. “legal” is not the same as “not too fast” – e.g. yesterday my wife complained when I was driving at 40 mph in a 60 mph limit and 50 would *definitely* have been too fast. The Kia had time to brake and still knocked a much bigger car across the road and off it. It may have been legal but it was too fast. It was a straight piece of A-Road. One of the few routes in that area. Very busy as a result, and lots of HGV with a schedule to keep. I’ve driven it a lot of times, and if you do much under 55 mph in the 60mph bits, you won’t enjoy it. Drive unreasonably slowly, and you will aggressively tail-gated, or overtaken with extreme prejudice. If you crawl along so slowly that you can avoid some senile buffon shooting out of a farm track because he didn’t even notice he was approaching an A-Road crossing and you’ll be forced off the road by some HGV in a hurry. NB It is also an offence to drive too slowly for the conditions. Shortly before 3pm. So he would have been driving into the sun. It takes time for the eyes to adjust, so entirely possible that this was a factor. As for the speed of the Kia – when approaching a junction or turning where another vehicle is attempting to emerge, then slowing down in anticipation that that vehicle will emerge is basic defensive driving – this combined with looking at where the driver is looking, analysing their body language, checking to see if the vehicle is static or moving. So, yes, probably too fast for the prevailing conditions – especially looking at the resulting damage. I’m not talking about dawdling here – just easing off enough to allow more time to react if the worst happens. Never mind Greeks Facepainter–you are using up space and oxygen that could be going to a decent human being. 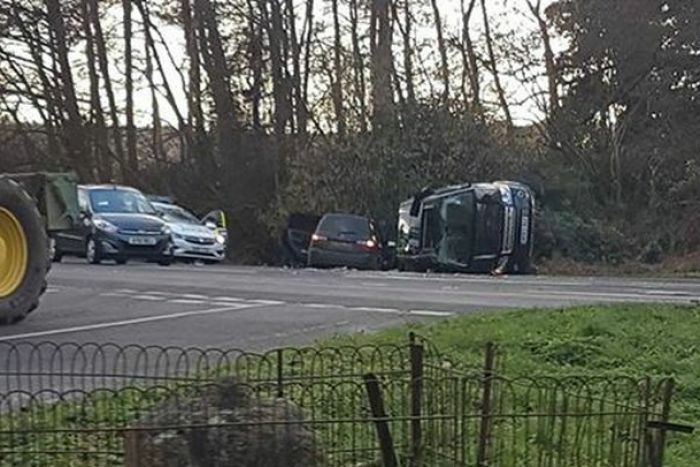 If it’s conceivable that the Norfolk police would charge some other 97-year old (who has since given up his licence and apologised) for what happened then he must be charged – Caesar’s wife and all that. If it’s inconceivable then he shouldn’t be. Its funny, the usual suspects are quite happy to make quips of ‘Phil the Greek’ about a man who has lived in the UK for 80+ years, has been a British citizen for over 70 years, and served the UK with distinction in WW2, yet if you happen to point out that Mo Farah was born in Somalia and that makes him at least a bit Somalian then you’re a racist bigot……………… the same people are also quite happy to call HMQ ‘German’ despite being able to trace her British born ancestors on the throne to the 18th century. I call it Quantum Racism – whether a statement is racist depends entirely on the nature of the person making the statement, and not the statement itself. She “feels safer”? Was there really a realistic likelihood of her being in another crash with the Duke of Edinburgh to have stopped her feeling safe? As a decendent of Electoress Sophia, and having been born before 1948, Phil was a British citizen from birth. And relinquishing his license won’t stop him being able to drive around Sandringham. Do people still listen to Gilbert and Sullivan? Yes, but hadn’t the Establishment rather embarrassingly forgetten about that law, so they insisted on him being naturalised, only to realise afterwards that it was unnecessary? I suspect there are more people who sing it than listen to it. Why are the hoi polio allowed to be near our royal rulers? And where was Phil’s security? All those busby wearers should stop posing for tourists and do their job. Given the absence of security, and the claim that he didn’t want to “lose his independence” by giving up his driving licence, I wondered who he was going to visit. A driver who stopped at the scene when interviewed said it was an overcast day, no sun, just saying. He went downhill after Clair.